Dr. Kathleen Thomas is an intensive care doctor from Australia who worked in the Médecins Sans Frontières (Doctors Without Borders) Trauma Centre in Kunduz, Afghanistan, from May 2015 until it was destroyed by US airstrikes on October 3. Here she describes a typical day in the hospital and the events that unfolded during the week of intense fighting leading up to the attack. The names of patients and some staff have been changed to protect their privacy. As soon as the simple distractions of daily Australian life momentarily pause, my mind immediately wanders back to Kunduz, Afghanistan. I am engulfed in a gaping dark pit, which holds me captivated while I try to excavate its contents. It’s not the horrific scenes from that early morning of the attack that I can make out; it’s not the deafening sound of the relentless airstrikes; it’s not the sights of partially amputated limbs, or the permeating smell of blood. It is a feeling of incomprehensible loss and grief that extends down into that bottomless pit. She shrugs. “I helped Dr. Hakeem with laparotomy at 2 a.m.” We smile at each other knowingly. It’s hard work… but this is what we are here to do, so no complaints. We wave politely to several of our hospital guards who greet our vehicles. I note the line-up of people waiting to be checked by security to ensure they are abiding by our “No Weapons” policy before entering the hospital — many men, some with crutches, one pushing a wheelchair which holds a boy with both legs amputated, and several women covered in blue burkas, all holding young children. As we walk from the Land Cruiser to the morning meeting room, we pass a gardener tending to the beautiful roses that fill the hospital compound. As I slip off my shoes outside the morning meeting room, I am met by the sound of about 30 people chatting away — the heads of every department in the hospital. I enter the room and we all sit together on the floor as the meeting begins. I remember how much it surprised me when I first arrived that we would sit together on the floor for a meeting — now it is just normal. For a moment, the electricity cuts out and the room goes pitch black. My attention is drawn to the heavy metal windows as one of the staff opens them, flooding the room with light. Ah yes, I think to myself — this is the “safe room” that we are supposed to retreat to in an emergency. I can’t even imagine what sort of emergency would lead me to ever use this room for its real purpose. How was I to know that on October 3, it would be where we sheltered from the aerial attack on our hospital — and later our makeshift emergency department and operating theater for injured staff, many of whom were present in the meeting that very morning? Everyone heads off to their respective departments to start the day. The smell of chicken greets my nose as I pass the kitchen, where lunch production is already underway. I stop at the laundry to pick up my freshly cleaned uniform, then over to the women’s dressing room, greeting Suraya, one of our translators, and Sorab, a mental health worker, on the way. I head to the Emergency Room (ER) where the ER doctors and nurses are working through the line-up of over 100 patients that will come through our doors that day, all victims of accidental and violent trauma. I pop my head into the resuscitation room. Mohibulla and Lal Mohammed, two skilled, efficient ER nurses, are assisting Dr. Amin to insert a drain into the chest of a young man who has been shot. The monitor above his head beeps reassuringly and two bags of blood hang next to the bedside. Doctors examine a head trauma patient at the ICU of Kunduz Trauma Centre in Kunduz, Northern Afghanistan. © Mikhail Galustov. I quickly look at the patient and his radiology. “All under control Dr. Amin?” I ask, knowing the answer. “Of course,” he replies without looking up. After four years in existence, the hospital has trained many skilled medical staff — Dr. Amin, Mohibulla, and Lal Mohammed being three of them. Dr. Amin regularly impressed me. Nothing seemed to faze him. He was competent and confident and worked at an extremely fast pace. I leave the ER and am greeted by the smiling faces of two of our cleaners, Najibulla and Nasir, who are wiping the floors diligently in the hallway. Neither speaks much English, and I speak little Dari so we have limited verbal communication, but I greet them with my hand over my heart as a sign of respect. I note their positive work ethic and good attitude. I enter the Intensive Care Unit (ICU) just behind a caretaker (a family member of a patient who stays with the patient 24/7, providing some of the basic nursing duties). I notice he is walking with a limp and uses crutches. As I follow him in I realise that he is a bilateral amputee and has two prosthetic legs. I wonder when and how his injury had occurred. Caught in cross fire? A stray missile? A random roadside explosion? As he heads over to bed four, I see he is the father of a young boy who had stepped on a landmine, also losing his legs. I feel a sense of hopelessness at this demonstration of trans-generational violence and suffering, resulting from over 30 years of war. Hamza*, 12, sits in his hospital bed during rounds at the MSF trauma hospital in Kunduz, northern Afghanistan, November 29, 2011. He suffered a fractured pelvis after being struck by a taxi. Dr. Martin John Jarmin III (left) conducts daily rounds in the in-patient ward. The MSF hospital opened in August, 2011 and provided surgical care and physical therapy. It was the only trauma center of its kind in the region. *Name has been changed. © Michael Goldfarb/MSF. I gather the ICU doctors to commence our ward round. Out of the corner of my eye I note Naseer and Zia, two hardworking, bright young nurses, helping a patient from his wheelchair back into bed. He is a large man who had become extremely weak after a prolonged stay in ICU following a bomb blast. Zia had taken him outside to get some much-needed fresh air. Before I can stop him, Naseer cradles the large man in his arms, then with one big heave, lifts him up from the wheelchair onto the bed. Rushing over to make sure Naseer hasn’t hurt himself, I tell him to please get help next time. He just smiles his big childish grin, laughs, and waves me away. Strongman Naseer, I call him from that moment on. By 10 a.m. the hospital is its usual flurry of activity. I leave the ICU to review a patient on the ward. I pass a lab technician bent over a microscope in pathology, walk through the ER, and past the Operating Theaters (OT). A patient from the wards is being pushed through the OT doors by a stretcher-bearer and greeted by Abdul Salam, a gentle, skilled OT nurse. The patient is about to undergo specialized trauma surgery that will be performed by a team of expert international and national surgeons. This is the only facility to offer this type of surgery in all of northern Afghanistan. MSF surgeon Dr. Martin John Jarmin III (right) operates on a 20-year-old man at the MSF hospital in Kunduz, Afghanistan, December 1, 2011. The man had suffered a gunshot wound to the lower chest and upper abdomen and required extensive exploratory surgery, during which a large section of his bowel was removed. The 55-bed MSF hospital opened in August, 2011 and provided urgent surgical care and follow-up treatment for people who suffered injuries, some life-threatening. © Michael Goldfarb / MSF. Beyond the OT, I pass the X-ray and outpatient departments, both of which are overflowing. Nurses are busy removing casts and applying new ones, dressing wounds, fitting crutches. I recognize a patient, nine-year-old Esmatulla, who walks in front of me being assessed by a physiotherapist. His limp looks better than the last time I saw him. Esmatulla had spent many days in intensive care after a serious car accident left him with a shattered pelvis, damaged lung, and completely sheared off the soft tissue on his back. His uncommon back injury required numerous operations, and we had called on guidance from experts from across the world to help with his case. It was a long hard road for Esmatulla, but he looks great and is almost back to his normal childhood life. I move on past the mental health, physiotherapy, and medical records departments prior to exiting the main building, and finally arrive in ward four, a small building lined with about 20 hospital beds. I see a physiotherapist instructing a middle-aged man on exercises for his newly amputated leg. I find the bed of my recently discharged ICU patient, Roshan, who I am here to review, but the bed is empty. The nurse explains that Roshan is out walking and goes in search of the patient. This is music to my ears — Roshan is walking! Roshan had spent much time in ICU after he was stabbed in the heart. Remarkably, the surgeons were able to repair the 2 centimeter tear in his left ventricle, but there was very little hope for his recovery. Yet here he is, slowly but surely walking back into the ward. I make some minor adjustments to his medications and advise Roshan that he will be going home tomorrow. He plays a tune on his hand flute to express his excitement. When we return home at the end of a long day, I remove my headscarf and walk out to the balcony with a few of the other international staff to enjoy the remaining daylight. The sky is filled with multi-colored kites darting around, controlled by young children on top of the neighboring rooftops. As the sun goes down, the mountains surrounding Kunduz are lit up by pink haze. The Imam in a distant mosque starts his call to prayer, closely followed by the more local Imams joining in, until there is a symphony of sound filling the sky. It’s a lovely moment in my day. November 2011: An eight year old boy who broke his leg in a fall plays in his hospital bed in the in-patient ward. © Michael Goldfarb / MSF. It was about two in the morning when I was woken from sleep by the sounds of intense fighting. Having been in Kunduz for five months of the “fighting season” I had grown accustomed to the sounds of war… but this was different. It was close, heavy, and coming from all directions. So, as had also become a habit when fighting became audible, I waited for the phone call from the ER announcing the onslaught of patients and the request for help. It took many hours for that phone call to arrive — the fighting was too heavy for anyone injured to actually get to the hospital… but then, as the sun rose on Monday, September 28, the fighting slowed momentarily, the phone call came, and began what would be the longest week of my life. The first day was chaos — over 130 patients poured through our doors in only a few hours. Despite the heroic efforts of all the staff, we were completely overwhelmed. Most patients were civilians, but some were wounded combatants from both sides of the conflict. When I reflect on that day now, what I remember is the smell of blood that permeated through the emergency room, the touch of desperate people pulling at my clothes to get my attention begging me to help their injured loved ones, the wailing, despair, and anguish of parents of yet another child lethally injured by a stray bullet whom we could not save, my own sense of panic as another and another and another patient was carried in and laid on the floor of the already packed emergency department, and all the while in the background the tut-tut-tut-tut of machine guns and the occasional large boom from explosions that sounded way too close for comfort. Taken October 1, 2015 — two days before the attack — staff and doctors treat people wounded in fighting that has broken out in the town. © MSF. Finally, at about 10 p.m. that night, the hospital slowed enough for me to sit down with some of the senior staff to consider the implications of what was shaping up to be quite a bit more than the usual “fighting season” conflict. We realized that it was not safe to move in or out of the hospital. This meant that no new staff could relieve the exhausted doctors, nurses, cleaners, stretcher-bearers, lab technicians, guards, etc., many of whom had already worked for over 24 hours straight. So we began what would become the twice-daily ritual of organizing a roster of sleeping shifts, reluctantly accepting that this was likely to be a marathon, not just a quick sprint. The hospital swelled far beyond our capacity that week. On the wards, all the beds were pushed close together to place additional mattresses on the floor. The OT ran all day and night to accommodate the ever-expanding list of injured patients. The demand for intensive care treatment was constant. We did our best with our limited resources, but helplessly watched numerous patients die who, in normal circumstances, would have survived. Some needed certain rare blood types but no one could get to the hospital to donate that particular blood group; some needed life support from a ventilator, but we had only four machines — not enough to go around; some had been stuck in their homes unable to come to hospital for several days, and by the time they arrived their wounds and bodies were overrun by infection which couldn’t be saved with surgery or our strongest antibiotics. 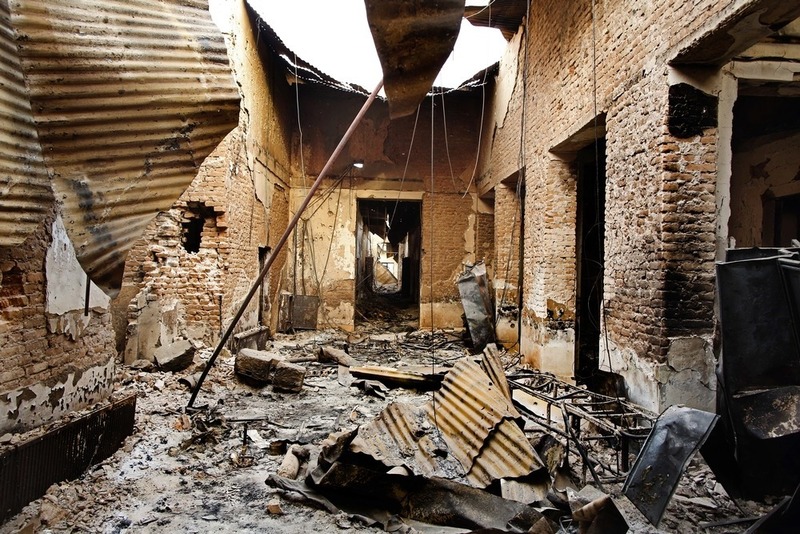 November 2011: The front gate at the MSF trauma hospital in Kunduz, northern Afghanistan. A no-weapons and no-payment policy is displayed on a sign. © Michael Goldfarb/MSF. Dr. Osmani was the senior doctor in the unit the night the fighting started and decided to stay with us, camping out in the hospital throughout the week. He had nothing with him except the clothes on his back, not even a toothbrush. His family was extremely worried for his welfare. He had a constant flow of phone calls checking on him, probably asking him to leave. When I expressed my concern about his lack of sleep and begged him to take rest, he just smiled his big broad smile and said to me, “Don’t worry Dr. Kass, I am fine. When I am here, I am happy. We are like a family.” Then laughing, he added, “And besides, I now have this,” he pulled out an old, tattered short wooden stick whose end had been frayed. It appeared to have teeth marks all over the frayed end. I picked it up, looked at it inquisitively and asked what it was. This made him laugh even harder. “It’s an Afghani toothbrush. One of the patients gave it to me when he heard me mention I didn’t have a toothbrush. Clearly, I couldn’t refuse.” We both laughed hysterically. It was precious moments like these that kept me going throughout the week and my heart now breaks when I realize just how precious they really were. These were perhaps the final moments of humor in Dr. Osmani’s life. We all knew that at times, our hospital was in the middle of the rapidly changing frontline — we could feel it. When the fighting was close — the shooting and explosions vibrated the walls. I was scared — we were all scared. When a loud BOOM would sound a bit closer to the hospital we would all drop to the floor away from the large windows that lined the ICU walls, looking around at each other with anxious expressions, half crying, half nervously laughing, finding a small amount of shared humor in the precarious situation that we had found ourselves in. We also tried to move the patients and large (flammable!) oxygen bottles away all from the windows, but the layout of the ICU prohibited doing this effectively. I worried constantly about the exposure from those windows — yet never thought to worry about the exposure from the roof — where the attack would come from several days later. Halfway through the week, a life-threatening injury to one of our ER nurses, Lal Mohammed, who had been struck by a stray bullet after leaving the hospital, brought about an emergency staff meeting. “But he is one of us — he can’t be injured,” is the deluded thought process I experienced while we worked on him in the ER. After he was settled in ICU, over 80 of us gathered together for the meeting. I noted a few fresh faces amongst the crowd that night. By this point in the week, many of the staff who had been with us for the first few days, had found some periods of decreased fighting to escape to their homes and take their families to safer places. In exchange came other staff who had been unable to reach the hospital until that point. Some had been trapped in their houses as fighting crisscrossed through their streets. Many staff were coming from other provinces, risking the dangerous roads to enter Kunduz. But in spite of all of this, they had turned up to work. In particular I noted Dr. Satar, our deputy medical director, and Tahseel, our pharmacy supervisor, both who had made the treacherous journey from Kabul that day to help us run the hospital. Seeing everyone standing together was a powerful reminder of just how many of us there were, all doing our individual jobs, working together to make the hospital run. I felt a welling of pride and honor to be standing beside these brave men and women — my colleagues, my friends — during such a challenging time in both their lives, and our trauma center’s history. May 2015: Qudus brought his four year old daughter khal Bibi in after she fell through the roof of their home and injured her leg. MSF opened Kunduz Trauma Center in August 2011 to provide high quality, free medical and surgical care to victims of trauma such as traffic accidents, as well as those with conflict related injuries from bomb blasts or gunshots. © Andrew Quilty/Oculi. I will never forget that a few hours later, I was passing through the ER when Dr. Sohrab, the ER supervisor, called me over. He was holding a six-month-old baby. After five months working side-by-side, it was the first time I had ever seen him look distressed. He told me that he had just declared the baby’s mother dead. When a bomb exploded in the road she had thrown herself over the baby, taking her life but saving his. We walked the rest of the way to the ward in silence as tears fell down both our cheeks. I felt hollow. I desperately wanted to hug him and tell him that everything would be ok, but firstly, it would not have been culturally appropriate, and secondly I knew that my words would have been lies. No one could predict the future. What a remarkable, brave, young doctor. He also informed me that Dr. Amin had returned after getting his family to safety earlier that day. I felt relieved knowing that two of our most skilled doctors, Dr. Sohrab and Dr. Amin, were two of the four remaining. Day five, the final day, was also one of unexpected optimism in ICU. Most of our patients were recovering from their serious injuries and were on track for imminent departure from ICU. 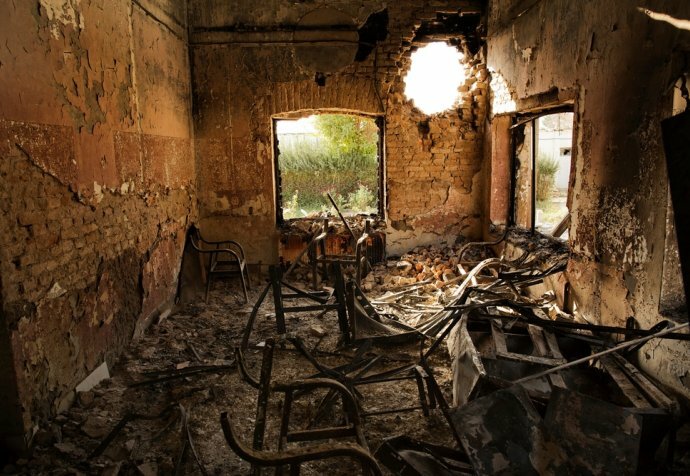 August 2013: Files lie on a desk at the ICU of Kunduz Trauma Center. © Mikhail Galustov. Our long-term patient in bed one, a man who had been severely injured in a car accident over a month earlier, was making great progress. After a series of life-threatening complications, he was finally strong enough to start the several-day process of weaning him off the ventilator. That morning after I told him that he was ready to start breathing on his own, he looked at me with such excitement and offered his hand to shake (a custom uncommon for Afghan men to a woman) — he was showing me his respect and appreciation. I had no doubt that he would get off the ventilator completely in a few days and he would go home soon after. Lal Mohammad, our injured ER nurse in bed two, had done remarkably well over his two day admission. I was extremely relieved to find him showing reassuring signs of a good recovery and made the plan to wake him from his induced coma the following morning. Shaista, a three-year-old girl, was in bed seven. She had her left leg and buttock blown apart by an explosion. She had lost almost her entire blood volume from the injury and had undergone a series of operations and blood transfusions to save her life. She was recovering remarkably well. I was extremely happy with her progress and planned to send her to the ward the following morning. Her mother, a beautiful young woman with a welcoming smile, never left her side and was visibly relieved when I told her that her daughter would go to the ward tomorrow. Wahidullah, in bed eight, was my miracle boy. He was a 12-year-old, the “top of his class,” his father had proudly told me, who had suffered a traumatic brain injury about two weeks earlier from a car accident. Despite our best efforts, he had remained in a comatose state, with no signs of recovery. He had been moved to the ward prematurely due to the demand for ICU beds and the need to rationalize our limited resources to those who had the best chance of survival. Unfortunately, we didn’t think he was one of those who would survive. That morning, Dr. Osmani and I were called to the ward for a cardiac arrest. My heart sank when I saw that it was this child. Resuscitation had already been commenced so we debated the futility of the situation. His father begged us to continue. To our surprise, he was quickly revived and somewhat reluctantly we agreed to take him back to ICU for a limited, short period of treatment. That afternoon, the miracle happened. His father got his mother on the phone, put it to Wahidullah’s ear and his mother spoke to him for some time. Immediately after that conversation, he woke up. He literally opened his eyes, starting mouthing words, followed commands appropriately, and shook my hand. Everyone from the ICU gathered round to watch this child, for whom we had pretty much given up hope for any meaningful recovery. It was a miracle. Flabbergasted, I told his father that we would remove his airway the following morning and he would then go to the ward. We smiled together, stunned but so happy. Tomorrow would be a good day. But tomorrow never came for most of those patients. Nor did it come for most of the ICU staff working that night. When the US military’s aircraft attacked our hospital, its first strike was on the ICU. With the exception of Shaista, all the patients in the unit died. The caretakers with the patients died. Dr. Osmani died. The ICU nurses Zia and Strongman Naseer died. The ICU cleaner Nasir died. I hope with all my heart that the three sedated patients in ICU, including our ER nurse Lal Mohammad, were deep enough to be unaware of their deaths — but this is unlikely. They were trapped in their beds, engulfed in flames. At the time of the airstrike, the operating theaters were in use — there were patients on the tables being attended to by surgeons and anaesthetists. © Dan Sermand. The same horror that rocked the ICU rocked the rest of the main building as the plane hit with alarming precision. Our ER nurse Mohibulla died. Our ER cleaner Najibulla died. Dr. Amin suffered major injuries but managed to escape the main building, only to then die an hour later in the arms of his colleagues as we desperately tried to save his life in the makeshift operating theater set up in the kitchen next to the morning meeting room. The OT nurse, Abdul Salam, died. The strikes continued further down the building, tearing through the outpatients department, which had become a temporary sleeping area for staff. Dr. Satar died. The medical records officer Abdul Maqsood died. Our pharmacist Tahseel was lethally injured. He also made it to safety in the morning meeting room, only to die soon after, having bled to death. Two of the hospital watchmen Zabib and Shafiq also died. Back home in Australia, I sip a cappuccino in a café overlooking the ocean. I hear a plane above but don’t bother to look up — there is no need — I know it is just a standard commercial plane and I am safe. How easy it is to adjust to the luxury of peace. I stare at the expansive ocean trying to understand my sense of heavy, pervasive loss. My eyes tear up as the raw grief I feel for my friends and colleagues tugs at my heart. And the patients! Oh the patients. So many bright young lives ripped viciously from this world. But it’s so much more than that; it’s the grief of the families of those lost on October 3; it’s the grief of all the Kunduz people who have suffered so many losses over their long history of conflict; it’s the loss of the four years of hard work by both the national and international staff to make the hospital what it was. I can’t help but think that every day the hospital is a burnt out shell is a day that could have seen dozens of lives saved and hundreds of patients treated. What will they all do — the survivors and future injured patients of Kunduz? What on earth will they do? Who will save the lives of all the people needing complex trauma care? Who will put their crumpled bodies back together? This is incomprehensible. I can only force my mind to move on before I fall too far into that bottomless dark pit of loss. 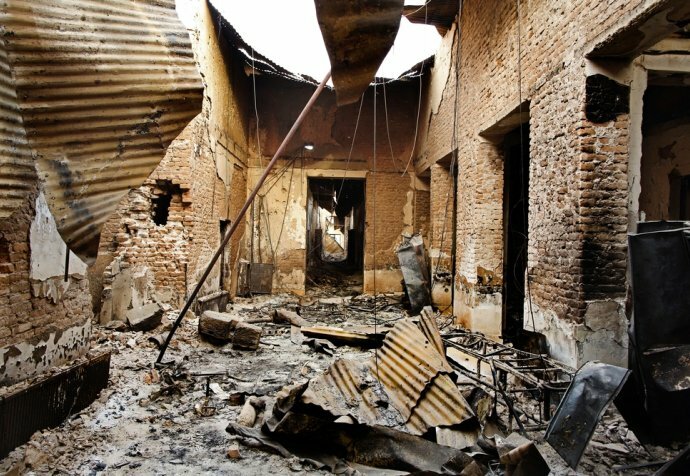 On October 3, 2015, MSF’s trauma hospital in Kunduz, Afghanistan, was destroyed by precise and repeated U.S. airstrikes. The attack killed 42 people, including 14 MSF staff members, 24 patients and four caretakers, and wounded dozens more. The facility was a fully functioning hospital at the time of the attack. The attack has had devastating consequences for the victims, their families, MSF teams and the entire community of Kunduz. Six months later, the hospital remains closed until further notice, leaving thousands of people without vital medical services.